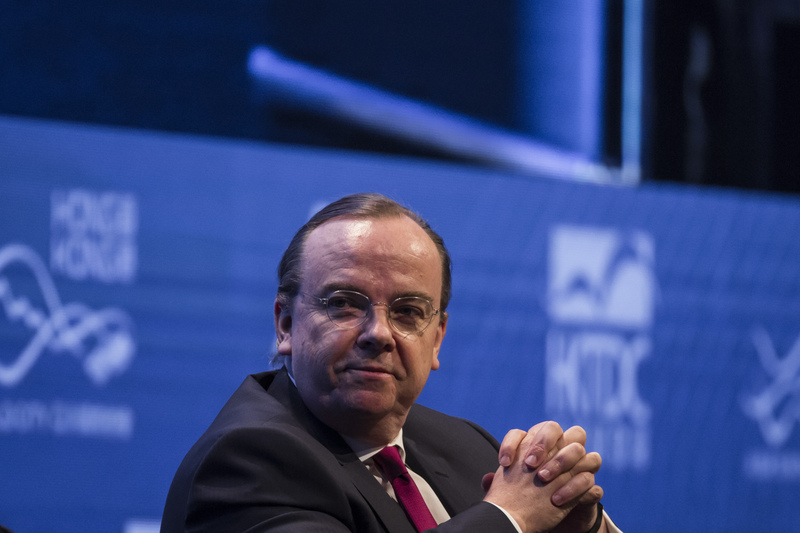 Eight months after HSBC Holdings Plc unveiled a $100 billion bet on Asia, crashing commodity prices and a slowing Chinese economy are checking Stuart Gulliver’s ambitions. The chief executive officer oversaw his first pretax loss as profit from Asia fell 14 percent to $2.82 billion in the fourth quarter and loans in that region dropped to the lowest in almost two years. The bank also disclosed that its hiring practices in Asia Pacific, like those of other lenders, are being probed the U.S. Securities and Exchange Commission. The results mark a setback to Gulliver’s efforts to bolster profitability and reverse a share slump by betting on the Chinese economy. Slower growth in the world’s second-largest economy may hamper the strategy, unveiled in June, to redeploy $100 billion of risk-weighted assets in Asia, and the bank said on Monday it will add staff for a China venture at a slower pace. “We will redeploy a little slower, we will hire a little bit slower,” Gulliver, 56, said on a call with journalists Monday. “We’re certainly not going to compromise our credit standards” for more loan growth, he said, adding that the change in pace doesn’t mean the bank will alter its strategy. Europe’s largest bank reported an unexpected pretax loss of $858 million, driven by a drop in revenue and an increase in impairment charges that was fueled by loans to oil and gas companies. The bank made a 7.2 percent return on equity, falling short of its target of more than 10 percent. Revenue in the Asia region dropped 5.7 percent to $5.46 billion, while loans fell to $356.4 billion, the lowest since the first quarter of 2014. Loan impairment costs jumped 26 percent in the region. Gulliver said Monday that hiring of 4,000 employees for a major development in China’s Pearl River Delta will take place over five years instead of three years as a result of economic and government turmoil. “China’s slower economic growth will undoubtedly contribute to a bumpier financial environment,” Chairman Douglas Flint said in the bank’s full-year results statement. U.S. authorities are examining whether the bank hired relatives of well-connected politicians or employees of state-owned businesses in the Asia-Pacific region, HSBC disclosed Monday. Other banks including JPMorgan Chase & Co. have said previously that they are facing similar investigations. HSBC dropped 1 percent at 4:13 p.m. in London, after earlier falling as much as 5.4 percent. Since taking over in 2011 Gulliver has announced more than 87,000 job cuts, exited about 83 businesses and has reduced the bank’s sprawling global footprint to 71 countries and territories from 88. While HSBC targets positive “jaws,” the difference between the rate of revenue and cost growth, the measure was negative 3.7 percent for the year. Revenue in the fourth quarter tumbled 18 percent to $11.8 billion as net interest income fell to $8.1 billion. Operating costs in the period amounted to $11.5 billion, down from $11.9 billion a year earlier. HSBC has started to feel the effects of declining credit quality as experienced by fellow emerging-markets focused lender Standard Chartered Plc, which reports its full year results Tuesday. Impairments on bad loans and credit-risk provisions increased by 32 percent to $1.64 billion in the quarter. That took full-year charges to $3.7 billion, exceeding the consensus analyst estimate of $3 billion. The increase in bad-loan charges in HSBC’s wholesale banking division, which accounted for almost $1 billion of loan impairment charges in the quarter, was driven by the oil and gas sector, the company said. HSBC has a “pretty strong” lending book in that industry, as about half of the firm’s exposure is to state-owned companies, Gulliver said on a conference call with analysts. HSBC reduced risk-weighted assets by $124 billion last year, taking it almost half-way toward the target for the end of 2017. The company’s end-point common equity Tier 1 capital ratio, a measure of financial strength monitored by regulators, rose to 11.9 percent from 11.1 percent a year earlier. The bank will “only” deploy capital in businesses that hit its return targets, Finance Director Iain Mackay said on a call with analysts. Management remained “very, very focused” on cutting as much as $5 billion in costs, which is a “significant undertaking,” he said. The bank declared a dividend of 21 cents for the fourth quarter, taking the total for the year to 51 cents. That’s 1 cent more than last year, maintaining the bank’s progressive dividend policy valued by investors. “Management is on the right track,” Martin Gilbert, CEO of Aberdeen Asset Management Plc, the bank’s sixth-largest shareholder, said in an e-mail. HSBC cut the annual bonus pool about $100 million to $3.5 billion, as overall employee compensation fell to $19.9 billion from $20.4 billion, according to the annual report. CEO Gulliver had his variable pay for 2015 cut 361,000 pounds ($513,000) to 3 million pounds, reducing his total compensation to the lowest since taking the CEO role in 2011. While the bank slowed some of its plans in Asia, executives still see reasons for optimism in the region. Even with the fourth-quarter decline, the region accounted for 84 percent of the company’s profit in 2015, up from 78 percent in 2014.